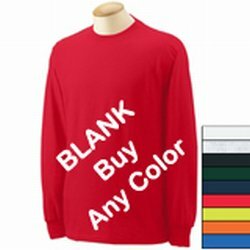 G8400 Gildan 50/50 Heavyweight Ultra Blend Long Sleeve Tee. 5.6 ounce. Seamless collar. Taped shoulder-to-shoulder. Double needle stitching. Ribbed cuffs.